DOYLESTOWN (PA) – History will be made on Saturday, September 20 as the Delaware Valley College football team will host the first night game in program history in a Middle Atlantic Conference (MAC) tilt with Wilkes University. Kickoff at Robert A. Lipinski Field at James Work Memorial Stadium is scheduled for 7:00 p.m.
Last year, the playing surface was switched from natural grass to field turf and a new, three-lane recreational track was also installed around the field. This past summer, light structures were installed, allowing for night games and practices for the various Delaware Valley teams. It is the home opener for the Aggies, which is traditionally the Hall of Fame Game. Lauren (Snyder) Stackhouse ’02 (women’s basketball), April (Mafturak) Stephens (women’s track and field), Josh Housekeeper ’04 (wrestling) and Mark Roth ’04 (baseball) will be inducted at halftime. Delaware Valley will have had two full weeks to prepare for the game when kickoff takes place as it had a bye week following its 30-20, road victory over Montclair State University back on September 6. That game marked the head coaching debut of Duke Greco, a 2003 Delaware Valley graduate who spent more than a decade on the Aggie sidelines, including the last eight as the offensive coordinator. Those eight years saw the team capture four MAC championships, make three trips to the NCAA Division III playoffs (second round each time) and win a pair of Eastern College Athletic Conference (ECAC) South Atlantic Bowl titles. Against Montclair State, Delaware Valley jumped out to a 13-0, halftime lead but then had to respond twice when the Red Hawks tied the game. The last was at 20-20 and the Aggies scored 10 points in a three-minute span in the fourth quarter to put the game away. Offensively, Delaware Valley finished the day with 487 total yards and saw the senior tandem of quarterback Aaron Wilmer (Philadelphia, PA/George Washington) and wide receiver Rasheed Bailey (Philadelphia, PA/Roxborough) have games to remember. Wilmer, a three-time all-MAC quarterback who is 26-7 as a starter, completed 22 of 36 passes for 394 yards and two touchdowns while also rushing for a score. The 394 yards was the second-highest, single-game total in school history (Adam Knoblauch holds the record with 423 yards in the 2004 NCAA playoff game against St. John Fisher) and it also put Wilmer over the 7,300-yard mark (7,323) for his career. Bailey, an all-conference honoree last season, was matched up with an All-American cornerback for most of the game and got the best of him as he hauled in 11 passes for 216 yards and a touchdown. The 11 catches tied a school record while the yardage total was the fifth-highest in a single game. The score was a 52-yard, fourth-quarter grab that made it a two-possession game. Bailey was named the MAC and ECAC Southeast Offensive Player of the Week and also earned a spot on the D3football.com Team of the Week for the effort. Sophomore tight end Stephen Greco (Shamong, NJ/Seneca) is coming off a big debut for Delaware Valley after transferring in from Wesley College. Greco caught three passes for 119 yards, including a 68-yard touchdown catch in the first quarter for the team’s first points of the year. Senior Chris Smallwood (Philadelphia, PA/Upper Moreland) heads the Aggie rushing attack. He netted 61 yards on 20 carries and also caught six passes for 38 yards at Montclair State. Defensively, Delaware Valley permitted just 105 yards in the first half and 51 yards in the fourth quarter at Montclair State. The unit racked up four sacks on the day. All-conference safety Danny Wynne (Hatfield, PA/North Penn), who led the team with 112 tackles, tied for top honors in the Montclair State game as he recorded eight stops (four solo). Wynne also added a forced fumble. Sophomore linebacker Frank Law (Wayne, NJ/Wayne Valley) tied Wynne with eight tackles, including 1.5 stops behind the line of scrimmage. One of those stops was a five-yard sack. Junior Rashaad Lighty (Pottstown, PA/Pottstown) is back at his natural outside linebacker position after moving to defensive end last season. At Montclair State, Lighty racked up seven tackles (3.5 for losses of 16 yards) and two sacks. Senior Brandon Snyder (Shillington, PA/Governor Mifflin) is coming off an opening game that saw him earn MAC and ECAC Southeast Special Teams Player of the Week accolades. Snyder connected on three field goals and three extra-points for 12 points, and he also averaged 39.1 yards on six punts. The Colonels, under new head coach Trey Brown, opened the season with a 34-0 home loss to Muhlenberg College on September 6. They followed it last week with a 41-7 pounding of Misericordia University in the MAC opener for both teams. Wilkes jumped out to a 34-0 lead over Misericordia and cruised the rest of the way. The Colonel offense racked up 381 total yards while the defense held the Cougar passing game to just six completions and 48 yards. The Wilkes offense is led by sophomore quarterback Ryan Dailey. Dailey has completed 17 of 37 passes for 287 yards and three touchdowns, including an 8-for-15, 212-yard, three-touchdown effort last week. Tight ends Drew Devitt and Jeremy Hartman as well as wide receiver Tim Bousson have one touchdown apiece. The trio has combined for 11 catches for 163 yards on the young season. Senior Ryan Behrmann and junior PJ Incremona have combined to lead the Colonel ground attack. Behrmann has carried the ball 19 times for 57 yards and one score while Incremona has 52 yards and two touchdowns on 17 attempts. On the defensive side of the ball, sophomore linebackers Tanner Stengel and Michael Condrad lead the way with 17 and 16 tackles respectively. 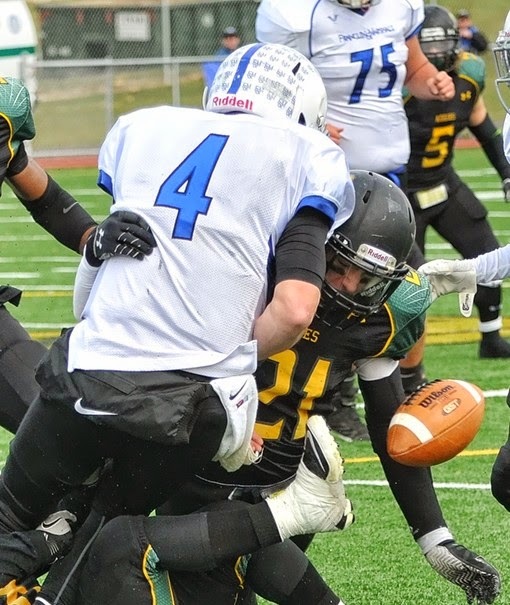 Stengel had nine stops against Misericordia while Condrad posted a team-best 11 tackles in the contest. Senior linebacker Nick Gray is another player to watch as he has 14 tackles and a team-best two sacks over the first two games. He had seven tackles and one sack against Misericordia last week.